UK’s leading Ground Source Heat Pump specialists Nic Wincott & Dr Robin Curtis visited our HQ in Brämhult. Kari Ojala COO MuoviTech International Group extended a warm Swedish welcome. There, together with MuoviTech UK’s Steve Sutcliffe, they inspected the Turbo collector extrusion facilities and saw manifold chambers and borehole probes being assembled and tested. 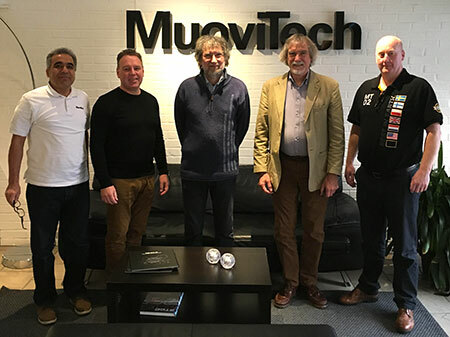 They also met with Ronny Eriksson, who explained in detail our quality management procedures and processes and Adib Kantalar head of MuoviTech R & D, who explained the Turbo collector and the benefits and advantages of using the technology in a Ground Heat Exchanger. Adib also took them on a tour of Borås University’s advanced Polymer R&D lab. Adib Kalantar, Kari Ojala, Nic Wincott, Robin Curtis and Steve Sutcliffe.